Got that dramatic, fuller lash line? Let go of your fears! Ardell’s best selling lashes are now available in a convenient value pack. With Ardell Natural Multipack Lashes, never run out of your favorite lash again; they will always be available when you have this four-lash value pack around. Buff up your natural lash line with fun and flirty Ardell Professional Natural Multipack, ideal for a prom night makeover, a stage performance, or a romantic night out. 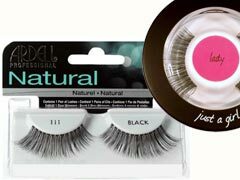 Especially great for large and round eyes, these cheap Ardell lashes have a full blunt cut for added volume. Easy to apply and stunning to behold, these 100% natural, low priced falsies give you a chance to save 25% on the regular price and can be conveniently purchased at Madame Madeline online store. With proper care and cleaning, these lashes can be used multiple times to add a new dimension to your eye frames, giving you great value for your money. For the novices who prefer to keep their lash line understated, Madame Madeline offers a great value pack of Ardell Individual Lashes. Ardell Individual Multipack Lashes contain 112 knot free clusters of 100% natural, individual lashes that are easy to apply and remove. Go all out to pile them up to skyscraping heights, or keep a light hand to blend them in; you will never run out of your falsies with this value pack around! Will it not stun you to know that the new Ardell Individual Multipack contains twice as many weightless and waterproof Ardell lashes as the regular individual lash packs? What more could you want than to redefine those eyelids without a blow to your fortune? Whether you are a makeup artist or an avid individual lash wearer, explore a whole wide variety of cheap Ardell lashes at www.madamemadeline.com without worrying too much about those credit card bills. At Madame Madeline, beauty does not come with a heavy price tag, so go ahead and make an impression!